Tourist Places in Delhi: Which are the Best? Delhi - the capital city of Indian Subcontinent is a delight for its dwellers as well as its explorers. A magnificent juxtaposition of ancient and new, the city calls for an all-inclusive travel experience. Whether you want to make a trip to citys historical testaments, pay homage to world-famous shrines in India, enjoy the serenity of old gardens or simply want to relish the best taste of India, Delhi has everything on its tourism platter. Start your expedition from the famous Qutub Minar and take a tour to all the splendid landmarks of the city. And if you want your Delhi voyage to be more planned, check the article, as it offers a sneak peek of the best places to visit in Delhi. Qutub Minar An extinguished example of Mediterranean and Indian architecture, this brick minaret is looking over Delhi since 13th century. Located in the magnificent Qutub Complex in Mehruali area of South Delhi, Qutub minar is supposed to be the tallest brick made minaret of the world. The foundation stone of this beautiful edifice was laid by the first Muslim king of India, Qutubuddin Aibak while it was completed by his son-in-law IltutMish. If you want to have a rendezvous with citys cultural diversity, this place is a must visit, as Qutub Complex offers a reflection of almost every king who reigned on Delhi whether you talk about pre-slave Delhi ruler AnangPal or later Islamic emperors. Watch Qutub Minar on Youtube. Chandni Chowk Once in Delhi you cannot let your trip forgo without making a trip to Chandni Chowk. Located in the heart of rambling Old Delhi, Chandni Chowk calls you to have a real glimpse of citys thousands years old culture. Its every narrow lane has a different story to tell. Check in the sprawling Chandni Chowk to pay a visit to the worlds biggest mosque -Jama Masjid as well as relish some of the most scrumptious flavors of India, as this bustling market is the home to Delhis oldest and finest eateries. Do not forget to eat Chandni Chowks most famous Gyani Ka Faluda as thats the most favourite of shoppers coming to this area for their shopping of electronics and clothing items. Red Fort Located next to Chandni Chowk, Red Fort is a symbol of Indias pride and power. Made of Red Sand Stone, this exquisite building was made by Mughal Emperor Shah Jahan with a motive to empower Delhi as the capital of the Kingdom. Red Fort has witnessed the best times of Mughal dynasty, British Rule and is an active participant of Indias present governance, as this is the venue of Prime Ministers Independence Day speech on 15th August every year. Visit Red Fort to get a glance of Indias political history. Watch Red Fort on youtube. Delhi Markets If you feel that Delhi is a delight only for epicureans and history lovers then you are not aware of citys best offering. The capital city of India is a paradise for shoppers of the planet too. Check the markets of Delhi for great shoes, imported cloths, attractive accessories, exclusive handicrafts and delicious street foods. The best three markets of the city are Central Market in Lajpat Nagar, Sarojini Nagar Market and Janpath and of course Chandni Chowk as mentioned above. Apart from these three, there are many more markets in the city which offer equally good shopping experience. Modern Marvels of The City One of the oldest cities of the world, Delhi equally lives in its older and newer parts. If its ancient monuments talk about citys glorious past, modern marvels of Delhi speak volume of its cultural and technological development. Some of the most illustrating landmarks of modern Delhi are Lotus temple, AksharDham Temple (as below) and Select City Walk (official website:selectcitywalk.com) Shopping Mall where all the rich people including film stars of India do the shopping. Shaped as a blooming Lotus, Lotus temple is the centre of Bahai faith in the city and it is located in Kalka ji area of South Delhi. Due to its striking architecture, this place is one among the most famous tourist attractions in the city and the world. 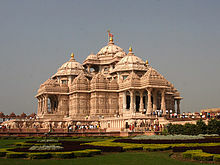 AksharDham Temple: This is another modern day attraction of Delhi which is prettily designed. Devoted to God SwamiNarayan, Akshar Dham temple is not only a pilgrimage site but also a complete tourist place which attracts with its great architecture, fascinating theme show and excellent multi cuisine restaurant. Watch Akshardham temple on youtube. If you are making the list of best places to visit in Delhi, its latest mall "Select City Walk" is a must include as mentioned above. Spread in an area of more than 1 square Kilometer, this shopping mall is famous for its highly fashionable crowd, great eating joints and world class showrooms. But prices are too high here. Gardens of Delhi Now after strolling around busiest attractions of the city, if you want to spend some time in lap of nature, you must head towards any of Delhi's lush gardens. However, Delhi is full of gardens but the three most remarkable green patches of the city are Lodhi Garden, Mughal Garden and Garden of Five Senses. Lodhi Garden is famous for its green beauty while Mughal Garden is famous for arresting beauty of its rose garden. For all those, who expects more from a garden, Garden of Five Senses is the destination. It is not just a park. It is the place where you can enjoy a lot of cultural activities in a greener backdrop.